Following the success of Iron Man, the next movie in the Marvel Cinematic Universe was release later the same year in The Incredible Hulk. Directed by Louis Leterrier who was known best for the Transporter movies prior to directing The Incredible Hulk was a decent choice for the movie. The movie fell flat and is noted as one of the worst entries in the Marvel Cinematic Universe. Starring the likes of Edward Norton, Liv Tyler, Tim Roth, and William Hurt as the main cast, the movie was not missing big names. 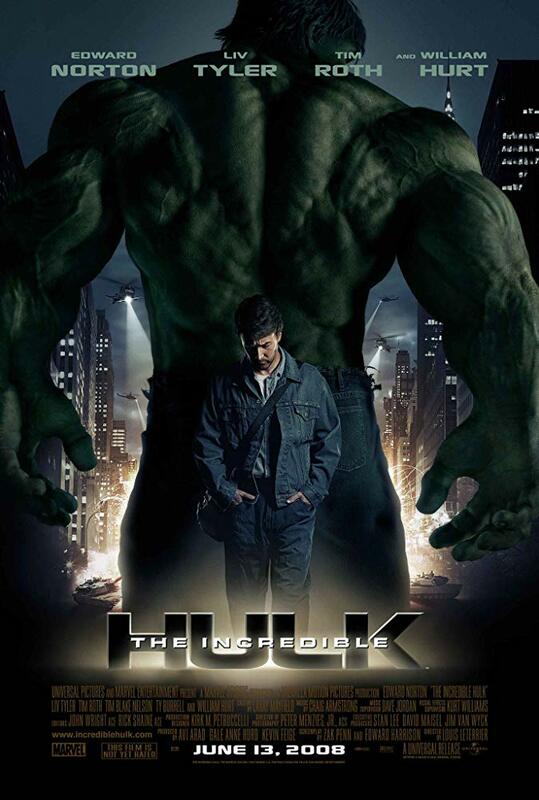 One of the biggest hold backs for this iteration of the Hulk was Ang Lee’s previous Hulk movie from 2003 which was critically panned, and because of this the movie started with a negative outlook. The first time I saw this movie I did not like it, but having a second viewing of it now, it isn’t as bad as I remember it being but it still isn’t very good. After an experiment goes wrong in trying to replicate the super soldier serum from world war II, Bruce Banner is turned into the Hulk. The story takes place some time after Banner initially turns into the Hulk, and it in hiding in Mexico learning how to control his temper as his anger is what turns him. Thaddeus Ross who first started the program is very inclined to capture Banner as he sees the experiment as a very possible success story for his experiments. Banner wants nothing to do with this though and has been working towards finding a cure with the help of a Mr Blue. Banner runs into a roadblock, requiring data from the lab that turned him in the first place to find a cure, as Ross finds his location and launches an assault to capture him. All the while Ross is working on creating a new super soldier in Emil Blonsky, who shows signs of having incredible healing abilities and strength after the tests. After being given a dosage of Banners blood though, he becomes the Abomination with the Hulk being the only person capable of bringing him down. The acting in this movie is done well, and the writing overall is not bad. The biggest issue this movie has is the pacing, there are just large portions of the movie in which nothing seems to happen. Even hours after watching the movie for a second time it is hard to recall some parts of the movie in the middle. The action scenes with the Hulk are fun to watch, and the end fight between Hulk and Abomination is a fun brutal punch fest between the two. Everything between those scenes though is boring dialogue and character development that seems to lead nowhere. There is a little development with Betty, who was Bruce’s girlfriend before the experiment turned him into the Hulk and he left to protect her, but it seems to happen on a coin flip where she leaves her life she formed in his absence just to be with him again on the run. All the while during this time, nothing seems to happen except to show that Banner has learned how to live frugally as he is in hiding. Almost a solid 30 minutes of this movie could be removed and nothing would feel left out. On top of that the CG has not fared well either, with Abomination looking like he is almost made of clay. There are points for the CG is very noticeable, even in scenes where it should not be. Coming after Iron Man this is surprising as the CG in that film blended in perfectly, the same cannot be said for The Incredible Hulk. On the other hands when it comes to Blonsky seems to have an irrational personality change through the movie that is not very well exclaimed. He is shown to be a very arrogant solider, yearning for more power. Once he receives it though, it is presented as if he is in control of his form in Abomination, noting he can speak and even recognizes people such as Banner, Hulk, and Ross. In this form though he go on a rampage the moment he turns, and begins destroying the city looking for a challenge, and even at one point goes to attack Ross who he looked up to for a portion of the movie, and allowed him the chance to get the serum to make him a super soldier. The extreme turn in his personality would have been nice to see progressively, or to see him go into a full on rage mode like the Hulk is supposed to be. Which the Hulk isn’t portrayed as out of control as everyone says he is. 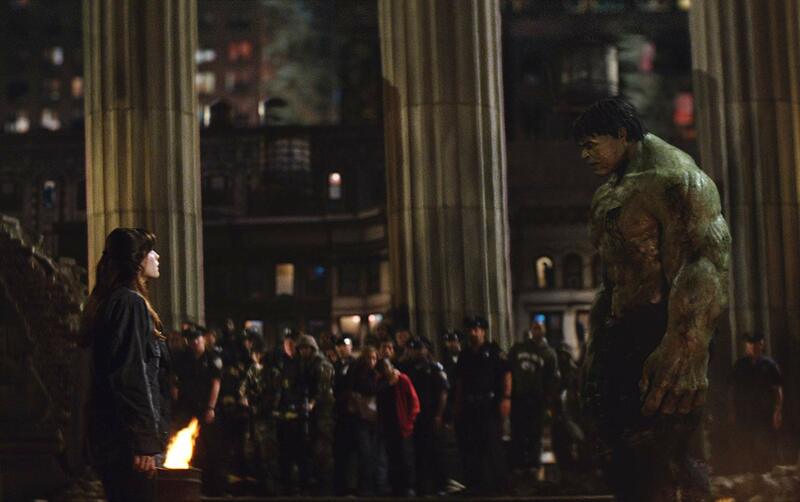 Throughout the movie it is implied that Banner cannot control the actions while he is Hulk, but while Hulk he shows a clear sign of intelligence, is able only acting reactionary to people attacking him, and will protect people who are in danger such as Betty. There are no scenes that make Hulk seem absolutely out of control, and especially in the end fight it appears Banner has complete and utter control over the Hulk. The movie seems to conflict itself here, and I am happy that future Marvel Cinematic Universe movies seems to better define the dynamic between Banner and Hulk. Overall the movie is not quite as bad as I remember it being, but it is still one of the weaker entries in the Marvel Cinematic Universe. With some pacing issues, and some inconsistencies there are plenty of parts of the movie that could be reworked. The acting is great though, and the action scenes do feel like they have some punch. While it is hard to hold it against this film, the hulk seems very slim compared to what we will come to see in future Marvel movies, so seeing this slimmer hulk was a bit odd, but nothing I could count against the movie as a whole as it works here. There isn’t really anything that comes out of this movie except for Ross and Banner (who was recast following this film) so skipping it for End Game probably won’t leave you missing out much.